The Bell 206L1 LongRanger II is a 7-seat light utility helicopter powered by a single Rolls Royce Allison 250-C20B turbine engine. In 1961, Bell developed Model 206 as the OH-4A to meet the U.S.Army requirements. The OH-4A flew first on 8 December 1962. However the Bell OH-4A didn't win the competition, the helicopter was a success as the Bell 206 JetRanger. The prototype of this five-seat commercial model, the Bell 206A JetRanger N8590F, flew on 10 January 1966. Bell received FAA certification for the helicopter on 20 October 1966, and deliveries of the Model 206A powered by a 317 shp Allison C18A engine, started in January 1967. In the early 1970s, production switched to the Model 206B JetRanger II with a 400 shp 250-C20 turboshaft. In September 1973, the development of the LongRanger, a stretched JetRanger was announced. The 206L LongRanger flew first on 11 September 1974 and production started early 1975. The Model 206L1 LongRanger II was introduced in 1978. More than 4800 206Bs and 1700 206Ls have been produced since the introduction of the 206A JetRanger on 13 January 1967, when the first two production aircraft were delivered to customers. Since, Bell has delivered five different generations of the commercial 206 with its 206A/B JetRangers and 206L/L1/L3/L4 LongRangers. Bell 206 aircraft are currently produced at Bell Helicopter's facility in Mirabel, Canada. Production of the Bell 206B3 JetRanger ended in 2011. The Bell 206L4 LongRanger IV will remain in production. The ICAO Aircraft Type Designator with Wake Category used to classify aircraft types for the Bell 206L helicopters is B06. On 1 October 2008, OLT Helikopterservice started ambulance-flights out of Emden. The OLT helicopters in service were Bell 206L D-HELF and AS355 F2 OE-FXH, in fact the helicopters of Teuto Air Bielefeld. OLT Helikopterservice is part of OLT – Ostfriesischen Lufttransport GmbH. Next to the ambulance-flights, OLT offered the helicopters for charters and for passenger and freightservices to the Offshore-Windparks. In 2010, OLT Helikopterservice was renamed NHC - Northern HeliCopters. The 1976-built Bell 206L1 LongRanger c/n 45029 was registered first N9954K in the US, before the aircraft was exported to Germany and registered D-HELF with DRF - Deutsche Rettungsflugwacht, Baden-Baden, in 1983. 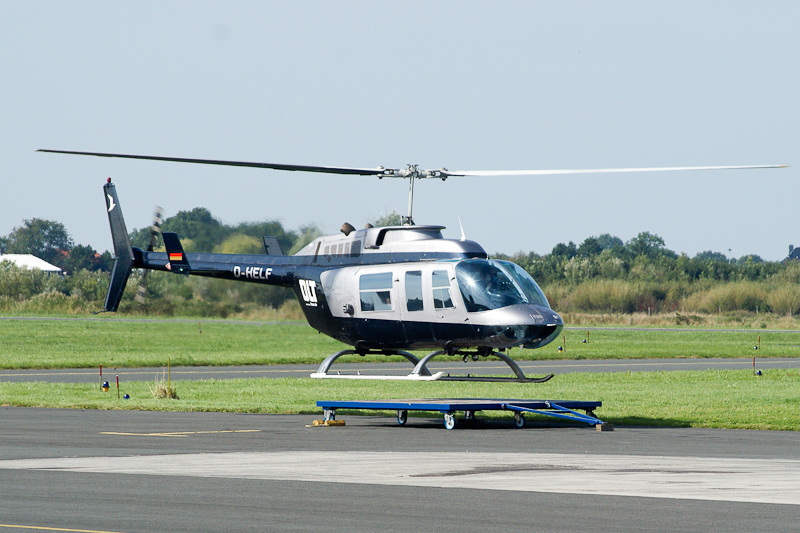 In October 1989, the helicopter entered service with Helicopter Service Hannover, Hannover. In August 1997, the aircraft was transferred to SILAG, and in January 1999, HeliAvia, Hannover, became the next operator of Bell 206L1 LongRanger D-HELF. In 2008, the aircraft was registered with Helicopter Airways, Hannover. At that time the aircraft was operated with Teuto Air Bielefeld. When operated on sightseeing tours during the International fly-in / Flugplatzfest at Bielefeld-Windelsbleiche airfield, the LongRanger wear next to the Teuto Air Bielefeld titles, OLT markings on the tail. In 2009, the D-HELF was registered with OLT Helikopterservice, Emden. On 4 January 2016, registration D-HELF was cancelled as exported to Austria and the same month the helicopter was registered OE- XMR in Austria with Rihs Fly-Helicopter GmbH.